Billy first burst into stand up in 2005 and has quickly established himself as one of Scottish comedy's most up and coming young acts with an ever expanding, cult following, thanks to his Unique yet slightly surreal style of storytelling, likeable on-stage presence, energetic on stage performances, near non existent attention span, and is widely regarded as a must see act that leaves audiences sore with laughter. Dubbed a ‘Comedy Fizz Bomb’ by The List Billy has also clocked up sell out shows at the Glasgow and Edinburgh International Comedy Festivals including “Smell Yer Maw” with Austin Low, and his own sell out one man shows “Billy Kirkwood is Childish” and “Billy Kirkwood is Stoopid”, and well as regularly gigging all over the UK he is the resident MC the hugely Sidesplitters Comedy Club in his native Ayrshire. A comedian with has a huge bag of comedy tricks at his disposal as he is a born improviser having appeared in a selection of improv based shows across the country as he enjoys interacting with his audiences and has seen him come into a into demand as a compere and event host and he can be seen performing gigs as both MC, support or host and can be seen performing all over the UK at all kinds of events. In the last 12 months Billy has since his profile rise and rise as, as well as facing huge demand for his work as a stand up, he has now made he leap to TV having worked as writer/actor on two hit TV shows for the BBC - The Kids sketch show 'Hedz' and the forth coming BBC show The Hidden Camera / Quiz Show 'Stakeout' as well as the show “Online Nation” on for American television on the CW Network and regularly heard on BBC Radio Scotland. Billy is also the host if the new the hugely popular alternative internet talk show 'The Gentlemen’s Closet (Visit – www.myspace.com/thegentlemanscloset) and is recently completed work on the comedy radio pilot 'TV morgue' with work soon to begin on a brand new Internet TV sketch show due summer 2008. 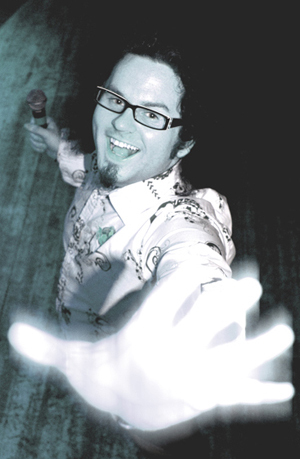 Billy Kirkwood is a comic to keep you eye on, cause who knows what he’ll do next!